We designed the M1/F1 as our flagship model, making no compromise. The result is a sound that is powerful, dynamic and highly sophisticated. The M1/F1 represents a major step forward in cutting edge technology having inherited and improved upon the advanced technologies of our P/C series. The inner housing is made from POM (Polyacetal resin) for its superior mechanical strength, excellent vibration damping properties and noise reduction capability. The contacts, made from beryllium copper, are heat treated to insure mechanical integrity and high conductivity. 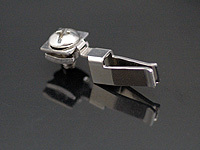 The plating of the M1/F1 is a combination of platinum and palladium which was selected after repeated listening tests. The powerful, dynamic, and highly-sophisticated sound provided by the M1/F1 is unmistakable and unforgettable for everyone. Because our products are so simply assembled, we have to closely examine the qualities of each component in detail. The characteristics of each component are harmonized to complete the M1/F1 as the ultimate product. The inner housing of the M1/F1 is made from POM (Polyacetal resin) for its machining characteristic and superior electrical isolation. And the outer casing is made of aluminum with alumite treatment for superior noise reduction. These are cut out from 40 mm round bars by NC machining and then nearly 85% of the original material is discarded (POM - 90g to 20g / Aluminum - 190g to 25g). The exquisite cutting accuracy is brought by Japanese craftsmanship. 30% glass filled PBT has excellent machine-ability and provides superior electrical isolation. The highly rigid body of the M1/F1 effectively attenuates high-speed vibrations. All screws, which were originally designed for M1/F1 and P/C series, are made of highly rigid stainless steel which is non-magnetic substance. 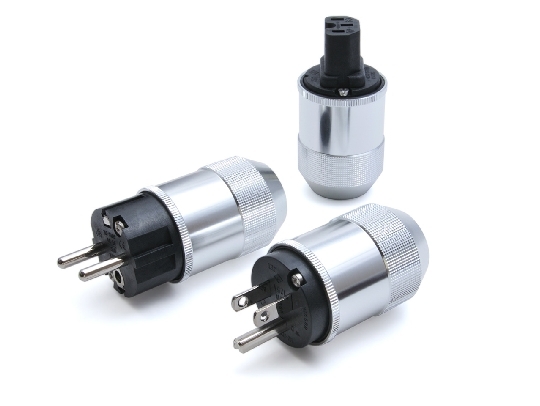 Moreover, the cable cannot be separated from the plug by a force less than 30kg, a significant safety feature. As the best material for the Premium Series, we employed beryllium copper for its superior conductivity and excellent mechanical characteristic. 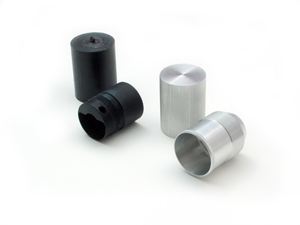 The contacts of M1/F1 are heat treated to insure electromechanical integrity. The 1.0mm thick and 6.0mm wide contacts provide maximum contact area, have more than 8kg of holding power and reduce vibrations at the point of contact with no loss of signal transmission. M1/F1 achieved to satisfy the requirements of high performance and safety. And its beautiful design was produced almost spontaneously as a result of pursuit for functionality. The inner housing is made from POM (Polyacetal resin) for its superior mechanical strength, excellent vibration damping properties and noise reduction capability. 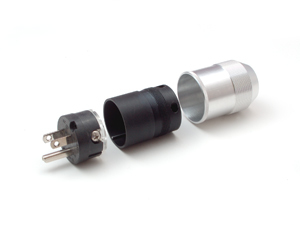 Because the turbulence of magnetic field is easily generated around connectors, we employed aluminum outer barrel for noise protection. This combination of materials actualizes high signal/noise ratio and attenuation vibration. 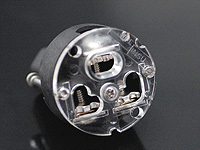 The maximum 17mm cable in diameter is installable. To complete the M1/F1, the manufacturing process is started from foundation coating. The material which was punched out as a part is polished by hand piece by piece after machined barrel-polishing. The plating of the M1/F1 is a combination of platinum and palladium which were selected as a result of repeated listening tests. The inner platinum layer is 0.5 microns thick and the outer palladium layer is 0.3 microns thick. 電線・ケーブル・オーディオ・専門店　小柳出電気商会（オヤイデ、oyaide） since 2009-01-23 / Copyright 2002-2011 OYAIDE ELEC.CO.,LTD. All Rights Reserved.